Oh I SO want to try that kind of pizza one day. And not that garbage Pizzaria Uno. on one hand, awesome! on the otherhand, i can see all the damn oil on the surface. bleh! never had a super deep dish looking pizza type before though. Sacrifice a few paper sheets to it. It might fix it. To each their own. Personally, I LOVE greasy pizza. That is not a pizza, that is brrrrrrr.... NO ... too much of everything. Heh it's an abuse to call it pizza, it's true. It's tasty though, as a meat and sauce pie or something. pizza-style meat pie? It does look yummy still though minus some of that oil. The dough is massive though so not quite like a meat pie but yeah I think probably that mozzarella cheese was a bit too oily for me too. Deep pizza is the best one! So it's basically a pizza pie. Awesome. I heard Lou Malnati's was really good. It certainly looks good. 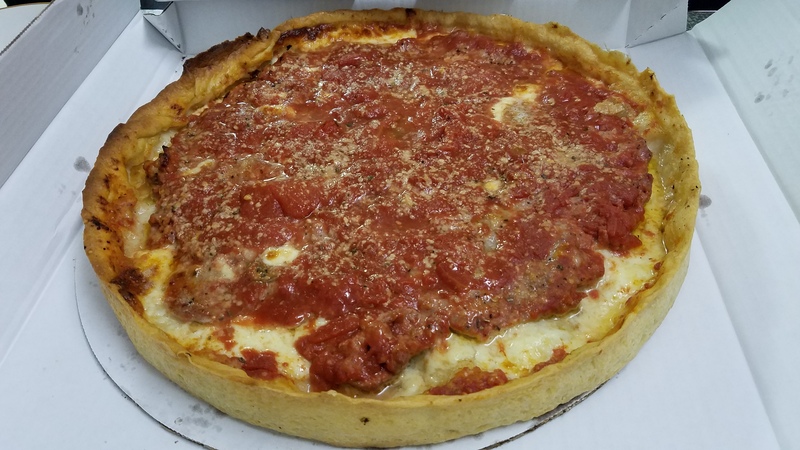 I'm not a huge fan of deep dish, but this one was the best I've had.